The second stop of the 2016-17 Collegiate Skate Tour went down this past Saturday here at the TWS headquarters inside our skatepark. With a student and non-student division, there was a good variety of skaters in each heat throughout the day with students competing from UC Irvine, UC San Diego, UC Riverside, Mira Costa College, Riverside City College, Allen Hancock College, CSU San Marcos, Rio Hondo College and University of Southern California. These dudes showed up and skated their asses off from the second they arrived until we finally had to kick ’em out! But not before one final (and heated) group game of SKATE went down to wrap it all up. And who could blame them? Check the video above to see what went down. We’ll see you guys next year! 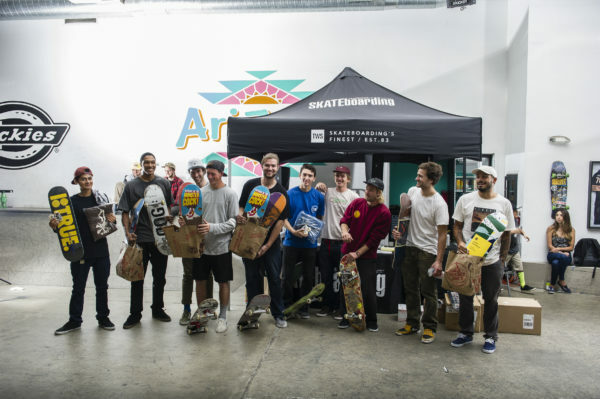 Visit the Collegiate Skate site to learn more about this awesome contest series and for some more photos from the day. Student Division winner, Robby Hargreaves was showing off his ATV skills all day. Non-student Division winner, Robert Milas, kickflip 50-50. Robert is a beast! Wouldn’t be anything without a product toss. Congrats to the finalists. Cheers to everyone who made it out!